The cosy and stylish décor in this complex will make you feel at home straight away. And you have a private terrace with a lounge area. Besides the community pool, there's a large garden and a tennis court at your disposal. The apartments are well furnished with wood-beamed ceilings, terracotta floors and beautiful wooden Tuscan furniture. 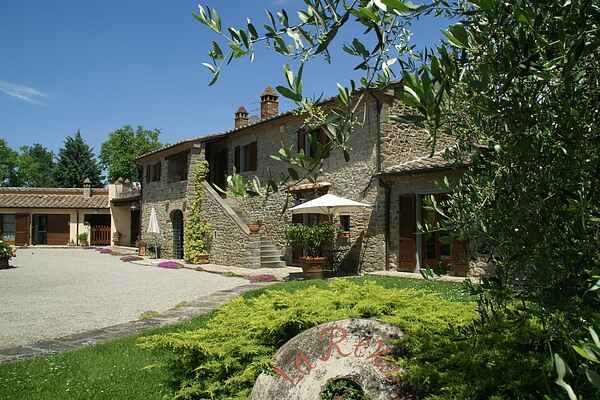 You are only a short distance from Cortona (3 km). A city you are bound to love; beautifully situated on a slope with narrow streets and good restaurants. There are also numerous sights to see like the cathedral, the impressive Palazzo Pretorio, the San Francesco church and 16th century Fortezza Medicea. There's a bakery and grocery shop in Montalla (1 km). Supermarket, post office and bank in Camucia (2.5 km). Restaurant in Ossaia (2 km). You can spend a day at the beach by the Lake of Trasimeno (15) in a jiffy. Here you can also take on a boat trip on the lake on one of the boats. You can even go ashore on the islands Isola Polvese or Isola Maggiore. Arezzo (30 km). Don't forget about Perugia (53 km), Pienza (40 km) and Montepulciano (40 km).